During the cold winter nights, it can be tempting to cuddle up next to a warm fire and slurp down a hot chocolate. However, doing this will increase your body's temperature and the likelihood of triggering or exacerbating night sweats. Night sweats are sudden bursts of heat and profuse sweating followed by fever and intense chills. They can range from very mild to severe and vary in frequency. Some women may also experience headaches, weakness, depression, an increased heart rate, and fatigue. These symptoms can be even more unbearable if you are wrapped under several layers of clothes or in a warm room. Night sweats can be triggered by several different factors, some you can adjust to, while others may be beyond your control. Begin by making small changes such as altering the number of blankets on your bed, using breathable fabrics, and keeping the room cool. Try out some of these simple tips to help you avoid sweaty sheets and sleepless nights. Control the thermostat. Try to keep your bedroom at a lower temperature than the rest of the house. Keep your cool. Keep a fan nearby so that you can easily turn it on during the night. The air blown by the fan will keep you and your bed sheets cool and dry. Just breathe. Maintaining a positive attitude and eliminating stress can be very beneficial to your health and can help reduce night sweats. Try some stress relieving techniques such as deep breathing exercises, meditation, and yoga. Peel off. Wear light layers and natural fibers like cotton. Wearing layers will allow you to easily peel off clothes and put them back on as your temperature changes. Also, use cotton and moisture-wicking fabrics for bedding and nightclothes so that extra moisture doesn't linger. Stop smoking. Smoking can have negative effects on menopausal women in addition to increasing the risk of developing cardiovascular disease and osteoporosis. Now, more than ever before, is a good time to quit. Exercise regularly. Exercising will help to keep stress at bay and alleviate night sweats and other menopausal symptoms. It's also beneficial to your overall health. Limit spice. Keep spicy foods to a minimum before bed. They can cause night sweats by increasing the body's temperature, and affecting the amount of sleep you get. Menopause is a natural progression that women should embrace. Although night sweats will disperse as time progresses, nobody should have to suffer with this uncomfortable and tiring symptom. 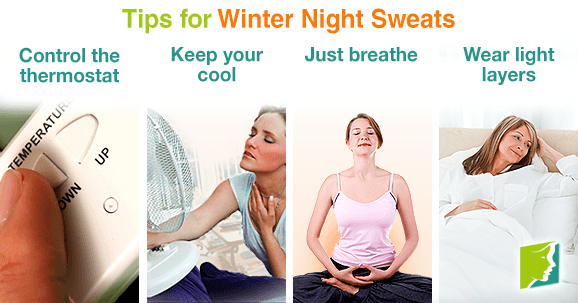 Try some of the above tips to alleviate your night sweats during the winter months. Click here to find out more information about treating night sweats during menopause. Night sweats are a common menopause symptom that disturbs sleeping patterns. Don't let menopause rob you of a good nights sleep. Learn how to prevent and manage night sweats during menopause.